On Saturday, May 10 from 6 to 10 p.m. Heather Warren-Crow and Seth Warren-Crow performed 4-Hour Confession (Pity Party #2) at Counterpath. 4-Hour Confession (Pity Party #2) is a participatory sound performance in which Heather Warren-Crow and special guests will take on the self-professed crimes of celebrities and fictional characters, from Anthony Weiner and Kanye West to Winston from 1984. 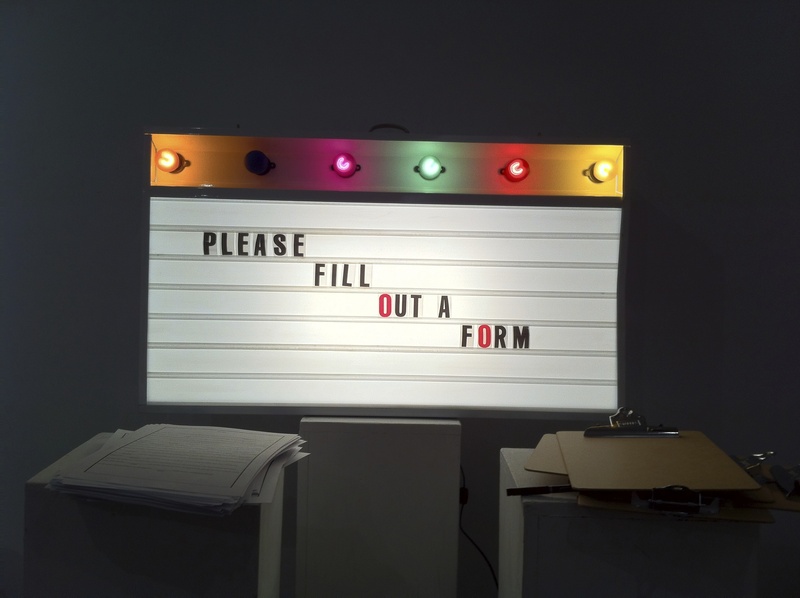 Using transcribed statements and appropriated text as templates (but with key words removed), Heather and her collaborator Seth Warren-Crow invite visitors to Counterpath to complete the confessions in the manner of the game MadLibs. Heather and guest confessors will read all of thesemeaculpas aloud, adding new scripts to the pile in real-time. Since no pity party is complete without sweet jams, Seth will process Heather’s voice and provide the sonic underscore for her tragicomic confessional. Participants are encouraged to stay as long or as short as they like, to arrive at any time from 6pm-10pm, and to eat, drink, and forgive. Refreshments will be provided. warren-crow+warren-crow is a collaborative team that crosses boundaries between performance art and sound art. Based in West Texas, the Warren-Crows often use amplified speech and digitally manipulated audio to explore the affective labor of media culture, in which celebrities need a spectacular confession in order to make it big, ruin their career, or both. warren-crow+warren-crow have performed at the SoundWalk festival of sound art (Long Beach), Hungryman Gallery (Chicago), and Diapason Gallery (Brooklyn), and Glasshouse (Brooklyn). As solo artists, they recently exhibited their work at PPL (Brooklyn), Independent Curators International (NYC), the Kitchen (NYC), Grace Exhibition Space (Brooklyn), Microscope Gallery (Brooklyn), Beton 7 (Athens), Mini Teatr (Ljubljana), and the KuLe Theatre (Berlin), among other venues.